Jogger Sexually Assaulted on Beach in Santa Monica - Yo! Venice! The Santa Monica Police Department is seeking the public’s assistance in identifying and locating a suspect involved in a sexual assault. On October 10, 2012 at approximately 4:50 a.m. a female victim reported that she was running along the beach, between the waterline and the lifeguard towers, when she saw a male suspect running directly towards her as she passed Lifeguard Tower 8 (located in the 800 block of the beach). The victim stated that she tried running away from the suspect who chased her and wrestled her down to the sand. The suspect physically and sexually assaulted the victim, who continued to fight and was able to free herself and run towards the Pacific Coast Highway. The suspect was last seen walking away northbound from the area. 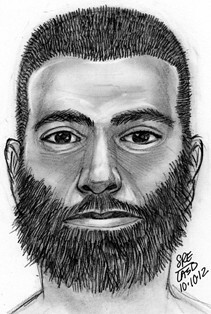 The suspect is described as a male White, approximately 30 years of age, 5’06” with a thin muscular build, short dark brown hair, a full beard, wearing only blue jean shorts. The victim did not notice the suspect to have any noticeable scars, marks or tattoos on his body. The initial investigation is ongoing and anyone with additional information is asked to contact Detective Phillip DeRyck at (310) 458-8944, Sergeant Darrick Jacob at (310) 458-8460 or the Santa Monica Police Department (24hours) at (310) 458-8495.